August 3rd, 2007, Runnemede, NJ - DYNAMITE ENTERTAINMENT today released art and information announcing the exclusive Dynamite Entertainment Exclusive Variant Cover Edition of Spider-Man/Red Sonja #1 -- featuring the extraordinary talents of Michael Turner and Peter Steigerwald! Only 4,000 pieces of this variant edition of Spider-Man /Red Sonja #1 have been produced and will debut at Wizard World Chicago in August thanks to Aspen Entertainment! The Spider-Man /Red Sonja #1 variant edition was made possible by Dynamite in conjunction with Aspen Comics and Marvel Comics and will be available at the Aspen Booth in Wizard World Chicago, August 9th – 12th! Don’t miss the debut! Then, for any fans not making it to the Windy City, the Spider-Man /Red Sonja #1 variant edition will be available through www.dynamiteentertainment.com and www.aspencomics.com (please note though any interested retailers should contact Dynamite concerning wholesale orders)! Dynamite stated, "For the issue #1 variant edition, Michael Turner and Aspen Comics created a spectacular cover featuring the Wall-Crawler and the She-Devil with a Sword. We worked with our good friends at both Aspen and Marvel to create this variant edition as a way to help promote the series. We want to thank all the fans of the Spider-Man and Red Sonja that have been lighting up the message boards in anticipation for the series—the first time these icons have teamed up since 1979!!! And, of course, the extraordinary Mr. Michael Turner— whose incredible talent is only matched by his art dedication. 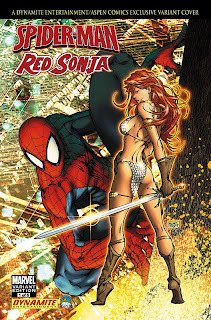 What’s more, fans should keep an eye out because a variant edition is planned for Spider-Man /Red Sonja #2, as well." 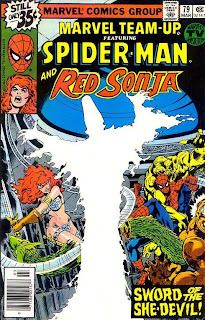 The Spider-man/Red Sonja crossover event marks the first time the characters have teamed up since the now classic Marvel Team-Up #79 (Marvel, 1979) by Chris Claremont and John Byrne. Issue #1 of the cross-over hit store shelves on August 1, 2007! Set as a Five-Issue event Limited Series, the crossover features Sonja's "Dynamite" creative team of writer Michael Avon Oeming, artist Mel Rubi and colorist Brian Buccellato. Covers for the series will be provided by none other than artist extraordinaire, Michael Turner. Following in the very successful footsteps of the Marvel Zombies vs. Army of Darkness crossover limited series (the first Dynamite/Marvel cross-over), Spider-Man/Red Sonja presents an in-continuity plot that fits seamlessly into both universes. This is the "must have" team-up of the year for Spider-Man and Red Sonja fans alike, as Marvel's Wall-Crawler and Dynamite's She-Devil with a Sword team up to battle the combined villainy of Kulan Gath and Venom! Plantilla por Makequick | Plantillas blogger por Aborregate .